October 2005 Craig was announced as the 6th actor to portray James Bond 007. November 14th, 2006 Casino Royale was released and premiered in London. If memory servers my correctly I believe I was at home when I found out the news that DC was the next Bond. Remember people going nuts over the color of his hair and that he was wearing a life jacket at the announcement press conference? DC has grown on me and I'm very excited about him doing a 5th Bond film and becoming the longest serving Bond. I believe Moore was 12 years and if DC return's and Bond 25 wont be out till 2019 at the earliest, thus he'll become the longest serving Bond at 13 years. My DC highlight is probably when I joined these forums and followed the production of SF closer then I have any film before. DC did Saturday Night Live and that 2012 Olympic commercial for whatever it was can't recall with the Queen and her dog. Good times. Has your opinion of DC change? and if so how? About Craig I couldn't then say a lot either way. What 'feelings' I had I saved up for other stuff until I had a chance to see the finished film. And I was pleasantly surprised by the result. I would have bet they'd have chopped and bobbed it completely out of proportion. They proved me wrong. And Craig was extremely convincing in his part, a much more rounded performance than one would have expected. I found him perfectly suited for this tale; as were most of the other cast. The film itself - and Craig with it - won over a large part of the former detractors. The BIG news about the follow up to QUANTUM OF SOLACE for me was the announcement of Sam Mendes for the director's chair. Although the film itself couldn't technically be announced because some unnamed player on the production side hit the ground running out of time, money, lenders, patience. Which just serves as a reminder that, the more things change, the more they stay the same. After a fashion. When that follow up finally did come, four years after QUANTUM, it delivered an interesting premise: is the best Bond film perhaps just a film with Bond, but not really a Bond film? SKYFALL for me is one of the very best entries in the entire series for the villain, for the Bond girl M, for the wicked plot and its many many facets of duplicity, treason, guilt and trust. All the things whiney fans kept complaining about for years: here finally they made the mix perfect and the result outstanding. Yes, there was some tough guy in a couple of expensive suits too. Drove a giant Corgi toy car from some Bond flick, downed a couple of Tequilas with scorpion garnish and did a splendid job standing atop some Whitehall roof looking across the City. Yes, he went by the name of Bond, 007 and did a nice Roger-Moore-as-Bond impersonation on a closed tube car door. 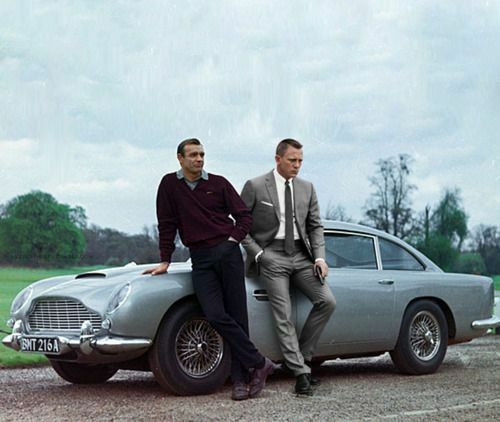 But overall he wasn't the reason SKYFALL was such a good film, he merely made it, by way of presence, into a Bond film. While the sound of bills running through money counting machines could be heard for months around the globe, the usual state of we-don't-know-yet befell the Bond world. Nothing was clear about the next film, except that Craig would of course be back. It's interesting to contrast this with the current state of affairs. Mendes refused to return to the series, then after long and insistent haggling - it would seem - agreed to do it one more time. People were still humming SKYFALL's theme tune when they heard Eon was willing to wait for Mendes to have him back. Then the next film was announced as SPECTRE and all the tell-tale signs in the tea leaves seemed to bode well for the future. Each new scrap of news on the production of SPECTRE made the film bigger by a magnitude of a hundred. Andrew Scott, Dave Bautista, Jesper Christensen, Lea Seydoux, Monica Bellucci - with each name the expectations grew bigger. There was some annoying noise from backstage to be heard, some band called 'The Sony Leaks' rehearsed for their big gig at the MGM Festival - but most of the fans didn't much care about that act. What they cared for was 'the Bond we all know and love'. Many would get just that model, warts and all. With SPECTRE Craig's tenure came full circle, artistically ending the film on a definite note of farewell. Much has been said already. And what's not been said before, some other guy or girl will no doubt say in the future. The ten years of Craig's era went by in a flash - but at times they feel closer to 25, with all conceivable ups and downs in between. It's been a tumultuous decade, with likely more of the same waiting just around the corner. And yet, James Bond will return. Wonderfully said, Dustin. A lot of your sentiments echo my own, though for me, the promise of "Casino Royale" has never been fulfilled. Still, I hope that Craig comes back in a fresh script. It'll be worth waiting for. For me, the tenure started with disappointment. Yes, I confess: I loved Brosnan as Bond. When the "impasse" passed and it was announced that he would not come back I was sad. I was even confused why this Daniel Craig dude who looked nothing like James Bond was chosen as a replacement. Getting "Casino Royale" finally on the screen (not as a parody) interested me. Since I mainly wanted a new Bond film I decided to wait and see. I went to a pre-screening in the night before the official release. The cinema was packed. I enjoyed the film a lot - although its stop-and-go pacing, especially after the torture scene, left the whole enterprise as choppy in my memory. I watched it again with my nephews - and funnily enough, one of them actually thought the film was ending when Bond and Vesper frolicked on the beach. I returned to the film a few times when it was out on DVD, and each time I admire parts of it, yet I could not get around Craig as Bond completely. He was intense, yes, and the arrogance was there, and I loved how he played the reaction to Vesper´s death. But there was still this... drum roll for a word play... spectre of Pierce Brosnan in my mind. Then came QOS. And I don´t exactly recall why - but I watched the movie during its first screening in my town and I loved everything about it. Even Daniel Craig. He completely sold the film to me. I even think that he is photographed so much better in this film than in CR. He finally became Bond for me, and I never had any big problems with the film itself. I think that CR could have been improved by compressing it - and QOS by enlarging it - but still, I consider QOS a better film. The long(er) wait for SKYFALL amped up my need for another Bond fix - and when I got the chance to watch it at an early press screening in a very beautiful and comfortable cinema, I was ready for something spectacular. And quite frankly, it was one of the best cinema experiences I ever had. I really loved every second of it... up to the finale which I still consider a great idea (reversing the usual attack on the villain´s lair) but it did slow down too much, for my taste, when the "Home Alone"-montage preparing for Silva started and it became clear that the whole assault will "only" destroy the building - but the real finale takes place in the chapel. Still, SKYFALL, for me, is one of the most satisfying Bond films and it cemented Craig in the role. Which raised my expectations for SPECTRE sky high, unfortunately. Again I was able to see the film in a pre-screening for the press, and I foolishly thought: this will probably even top SKYFALL. And after the car chase my spirits sank, and I thought again and again: nooo, nooo, nooooooo, please! I had not read any of the SONY leaked documents before, I had only watched the trailers and had constructed a film that already was better than the actual one. My expectations were different, and the film naturally was crushed underneath them. I gave it a second chance a few weeks later - and still, the great bits (and there are those!) stood out, and the bad bits still irked me tremendously. SPECTRE seemed to have the potential to be the best Craig film yet - and it became the worst for me. And then, a few months later, I watched it on blu ray. And... I enjoyed it so much more. Maybe because my expectations weren´t so high anymore, maybe because I knew now what the film wasn´t, maybe just because I wanted to like it and I got the feeling that this is the last chance for many years to see a new Bond film... so I better get used to this one. But with passing time it still has its flaws. Things I just can´t rationalize. And Craig´s performance, while wonderfully relaxed back at times, becomes "business as usual" in the disappointing second half of the film. With the ending as it is laid out and even confirmed by Craig recently as "Bond thinks he is leaving the service", I just cannot imagine right now how the next film will be able to offer us and Craig the chance of something new and different. I was okay with him leaving the role. It seems he is contemplating coming back, however. Maybe he still has one all-around entertaining film in him. I just hope that he will not end his tenure by going through the motions again. That would taint his work much more than leaving now, IMO. If memory serves, I was on vacation when I saw the news about Craig's casting. I remember being somewhat intrigued, but not overly agitated either for or against. When they announced Craig and I saw the press conference photos, I thought, "Huh?" and assumed they'd get around to coloring his hair, at least, but overall I thought, "At least they're thinking outside the box," since one of my gripes about Brosnan was that he seemed like a "kit-built" Bond; he looked like you'd expect, dressed like you'd expect and was pretty much an amalgam of earlier Bond actors, but in the end, for me, that ended up being a weakness and not a strength: after 40 years, the umpteenth re-tread was the last thing they needed. Picking such an unexpected, untraditional actor as the new Bond seemed a step in the right direction, though I remained largely indifferent to the whole thing as I really, truly was "over Bond." When CR finally came around, it was the best time I'd had with Bond in many years, because my indifference had kept me from following any news about the film. It was the first time since "Raiders of the Lost Ark" that I'd gone into this type of movie with almost no idea what to expect, and that made it great fun. Plus the fact that I'd "written off" Bond made it easier to me to start fresh on this new iteration without demanding it be this or that. No, Craig didn't look like my mental image of Bond, but then the movie didn't fit my notions of what a Bond movie was, or had been. For the first time it didn't matter how well a film did "the Bond thing," because this one was doing something else. Ten years later, I have to say I don't enjoy "Nu Bond" as much as "Classic Bond" (at least up to TLD), but I'm still glad they went for something different. If I have a concern at all, it's that I don't know that Craig's Bond has been presented in a way that anyone else could just step in and take over. It's so specific to him, I think it'll take another reboot to sell a new Bond, and I don't really relish the thought of rebooting every few films. CR is still my favorite Craig entry, BTW. Re-watched the Daniel Craig films and thought I'd weight in on Daniel Craig once more. A lot of feelings of resentment come up when I watch Casino Royale. Mainly because I grow up with Pierce Brosnan and he was my Bond. I really wanted a 5th Brosnan film and truly believed that each series or era should be 7 films long. Connery and Lazenby did 7, Moore did a 'true 7' and Dalton and Brosnan should have done 7, thus a 5th Brosnan film. But I understand that is a lot of work and commitment on all fronts that it may not always be possible anyway. It looks like we'll be getting a fifth Craig film but for a while we didn't know what was going to happen and I was in the same place I was over 10 years ago although now hoping for a 5th Craig film. 7 films from a single actor ? If they HUSTLED -- which would not bode well for quality -- that would mean 14 years from 1 actor...if they're 30 when starting, they'll be 44 when done and the fans would, by then, be waxing nostalgic over how the actor used to look...as might that actor ! My first impression of Craig was, "who dat?" I literally knew nothing about him. But like some others round these parts, I was not a huge Pierce fan and DAD had completely, utterly soured me on the character and the series. So I went in to CR with lowered expectations (probably the last time ever in that department). And, as you could probably imagine, I was BLOWN AWAY. CR and Craig rekindled my 30 (now 40!) year old love affair with Bond. And to this day, he is still my favorite. He is the first Bond actor to be (slightly) younger than me, and the first Bond that didn't reflect the classic image of Tall and Dark (of which I am decidedly neither). So yes, you could say that he is "my" Bond. Just thought this would be a nice place for this pic. That`s awesome but what about this guy? Casino Royale was the first Bond movie since 1983 that I did not see on opening weekend. I re-read the novel beforehand and that helped me appreciate it because I was blown away by the film. From the monochromatic opening through the construction site (triggering my growing fear of heights as I age), I left thinking there's no way Brosnan could have pulled that off. Been a Craig fan ever since. He's behind only Dalton for me in terms of faithful portrayals of the character. Quantum of Solace nearly opened on my birthday, but was delayed a week (thanks, Harry Potter scheduling). It dovetailed with my divorce so I found myself identifying with the short story more than the movie. CR should have ended with Bond and Vesper sailing into Venice, and QoS should have opened with her betrayal of Bond (sort of like how OHMSS was originally cut to end.) It was lacking some Bond elements, and reminds me of Licence to Kill a lot. Olga Kurylenko is my favorite Craig Bond girl, but the titles and its song are terrible. Doesn't feel like a Bond film, more like Bourne. Skyfall was fun in that with the 50th anniversary everyone wanted to see a Bond film. This was Bond's Star Trek IV movie, the one everyone had to see, even if they weren't a fan. Caught a preview screening 7 minutes past the end of my birthday. My mom had died that morning so I was in a daze through most of the film. Loved the Tennyson scene--chills. But didn't realize the personal symbolism of M's death until days later. I couldn't wait for SPECTRE, and generally enjoyed it on opening night (again, just missing my birthday!) I have issues with it like everyone else, but generally feel its parts are greater than its sum. If I think about Dennis Franich's interpretation that Bond dies on Blofeld's table and the rest of the movie, indeed the whole Bond canon, are figments of his dying fever dream, then I think it works and is brilliant. But how the writiers extricate themselves from this corner with Bond 25 is a mystery. I think Craig will return for one more, and hope Bond 25 is Garden of Death. Bond films always serve as a visual nostalgic soundtrack. TSWLM was the first one I saw in the theater and I have managed to see every Bond film on the big screen. Usuallly, long gaps between Bond films coincide with some depressing part of my life, so the thought of waiting until 2019 makes me shiver! I've seen them with different friends, girlfriends, and introduced the series to my ex wife's son. But with the Craig era ending soon, I'm sure another phase of my life will begin. Until then it's not "Goodbye, Mr. Bond" but let's just say, "Au revoir." Well he great as 007. 4 is not enough of Daniel Craig he should only comeback in Bond 25 as 007. He my third favourite Bond. He's my third favourite too, but only because of the strong nostalgic connection I have with Connery and Moore. I can understand that perfectly. Moore was my first, and at that time only the Connery films were available, too (and, well, Lazenby). But those two just could not be replaced by anyone who follows. As much as I enjoy Craig, he cannot, for me, crack that glass ceiling, and nobody will ever be able to.